One-roomed apartment of 30 square meters (30 square yards), sleeps 2+1, composed of: a double-room with a sofa-bed for a person, small kitchen, bathroom with shower, balcony with a splendid sea-view. Air conditioning/heating- TV colour - Refrigerator- Free Cleaning Everyday - Hair-drier - Pay car in a parking with convention (on request, see the tariffs) - Shops, bars and restaurants available nearby - Stop bus at 100 mt. away - Main beach at 1 km away with communications by hydrofoil to Capri, Ischia and Amalfi. Ludovica Apartment type B is a charming apartment for 2+1 people, located in the center of Positano, and with a splendid sea-view and air conditioning. When You enter the apartment, You find first of all on the right the bathroom with shower and the wall mounted hairdryer. Then on the same side there the kitchen which is equipped with a cooker, which has two electric burners, hood fan, refrigerator with freezer and toaster. And in the front of the corridor there is the bedroom with a double bed and a sopha-bed (sleep 1) : this large room has a balcony with a spectacular sea-view. The apartment has been completely restored in 2002. The floors are tiled with lucid Vietri majolica tiles, decorated with flowers, and the furnishing is new and very pleasant. 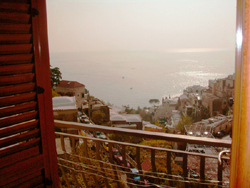 From the balcony you will enjoy the splendid view of the sea and of Positano. The apartment is part of an ancient building of Positano, elegantly renovated, both externally and internally. 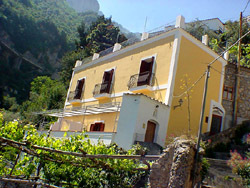 The small building, where Ludovica Apartment type B is placed, is itself part of the characteristic landscape of Positano. 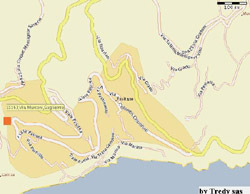 It is located halfway between the coast road and the sea, in a central position inside the village. To reach the apartment, You have to climb up a staircase of roughly 50 steps – no lift- , but consider that this is the feature and the beauty of Positano: steps everywhere. Younhave to climb up or get down. At the beginning of the stairway you will find the main road, as well as the local bus stop and a secure parking lot. 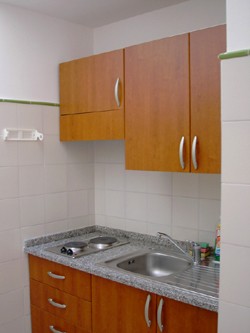 Guests of Ludovica Apartment type B can park in this area at a reduced price. The beach is approximately 1 km (half a mile) along the road. You can also easily reach the sea and the beach facilities by an elevator, approximately 250 meters (270 yards) from the apartment. Shops and restaurants are close by. Staying at Ludovica Apartment type B you will be just a few footsteps from the intense life of Positano, in a quiet and panoramic area, and in a very pleasant and relaxing environment. You will be fine without a car, or use it, if you wish, only for trips outside of Positano. Positano is a village of the Amalfi Coast which is well connected both by land and by sea. From Positano you can easily reach Amalfi, Capri, Ischia, Sorrento, Pompeii, Herculaneum, Naples, and Salerno.